Ursula Hegi is one of my favorite authors. When I read she had a new book, I hurried to put my name on the waiting list for it at our library. Children and Fire is told in the voice of a 34-year-old, 4th grade teacher living in Germany in the years just prior to World War II. If you have read other books by Hegi, you will recognize familiar characters as the story takes place in the same town as some of her earlier novels. This tale has many layers and centers on the meaning of truth, fear, and ultimately, courage. I don’t want to tell too much of the story because it is a good one which I believe should be discovered by the reader as the story unfolds. My only difficulty with this book was the fact that small parts are written in German and I didn’t want to take the time to look up the translations. Other than that, if you enjoy Hegi’s work, you will enjoy this book. 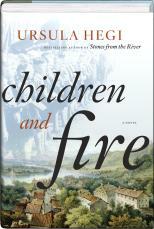 This entry was posted in Uncategorized and tagged Books, Children and Fire, Germany, Hitler, Nazis, Ursula Hegi, WWII. Bookmark the permalink.